INTRODUCTION: In difficult cases involving the gallbladder, the use of intraoperative cholangiography has been shown to be beneficial. The inflammatory reaction that is associated with empyema of the gallbladder is frequently quite severe making laparoscopic cholecystectomy difficult. 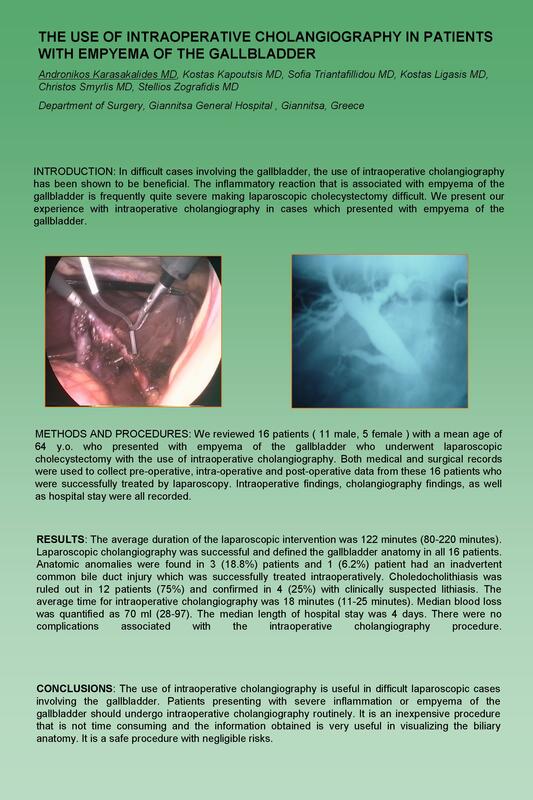 We present our experience with intraoperative cholangiography in cases which presented with empyema of the gallbladder. METHODS AND PROCEDURES: We reviewed 16 patients ( 11 male, 5 female ) with a mean age of 64 y.o. who presented with empyema of the gallbladder who underwent laparoscopic cholecystectomy with the use of intraoperative cholangiography. Both medical and surgical records were used to collect pre-operative, intra-operative and post-operative data from these 16 patients who were successfully treated by laparoscopy. Intraoperative findings, cholangiography findings, as well as hospital stay were all recorded. RESULTS: The average duration of the laparoscopic intervention was 122 minutes (80-220 minutes). Laparoscopic cholangiography was successful and defined the gallbladder anatomy in all 16 patients. Anatomic anomalies were found in 3 (18.8%) patients and 1 (6.2%) patient had an inadvertent common bile duct injury which was successfully treated intraoperatively. Choledocholithiasis was ruled out in 12 patients (75%) and confirmed in 4 (25%) with clinically suspected lithiasis. The average time for intraoperative cholangiography was 18 minutes (11-25 minutes). Median blood loss was quantified as 70 ml (28-97). The median length of hospital stay was 4 days. There were no complications associated with the intraoperative cholangiography procedure. CONCLUSIONS: Ôhe use of intraoperative cholangiography is useful in difficult laparoscopic cases involving the gallbladder. Patients presenting with severe inflammation or empyema of the gallbladder should undergo intraoperative cholangiography routinely. It is an inexpensive procedure that is not time consuming and the information obtained is very useful in visualizing the biliary anatomy. It is a safe procedure with negligible risks.